The Oxford Lab Products BenchMate Digital Tube Rotator is ideal for a variety of laboratory applications that require the gentle mixing of biological samples, such as the mixing of blood samples in blood collection tubes to prevent coagulation, immunoprecipitation, latex agglutination assays and preparation of homogenous dispersions (the mixing of powdered/solid and liquid samples). 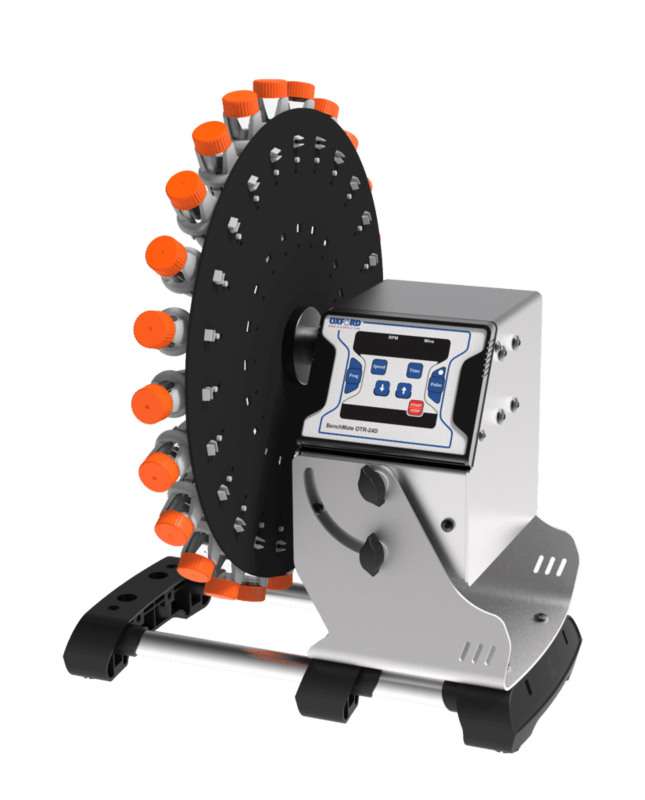 The BenchMate Digital Tube Rotator is supplied with any one of three optional disc plates of your choice. The digital tube rotator has an adjustable speed ranging from 10-80 rpm in steps of 1 rpm and with an accuracy of +/- 1 rpm. The BenchMate Digital Tube Rotator has a timer setting from 1 to 99 minutes as well as infinite mode. The BenchMate Digital Tube Rotator has an adjustable rotor angle that can be adjusted from 0 to 90 degrees. The digital tube rotator is also programmable. The user can set and save up to 9 user-defined programs or protocols. The digital tube rotator has the option for auto power on in case of a power failure. Upon the return of power, the unit will start automatically and run for the remaining runtime. The disc plates are easily removed and installed for quick and simple replacement and cleaning. You may also be interested in BenchMate Conical Tubes. 3 plate options available: Supplied with any one disc plate of your choice. Adjustable speed ranging from 10-80 rpm in steps of, and with an accuracy of, +/- 1 rpm. Timer setting from 1 to 99 minutes, and infinite mode. The angle can be adjusted from 0 to 90 degrees. Programmable – The user can set and save up to 9 user-defined programs (protocols). Option for auto power on in case of power failure – on the resumption of power the unit will start automatically and run for the remaining runtime. Easy removal and installation of disc plates for replacement and cleaning. Pulse Mode Yes. Alternating clockwise and anticlockwise motion with 2 sec stops for better and thorough mixing.